The small white-fox working terriers we know today were first bred by the Reverend John Russell, a parson and hunting enthusiast born in 1795, and they can trace their origin to the now extinct English White terrier. Difficulty in differentiating the dog from the creature it was pursuing brought about the need for a mostly white dog, and so in 1819 during his last year of university at Exeter College, Oxford, he purchased a small white and tan terrier female named Trump from a milkman in the nearby small hamlet of Elsfield. Trump epitomized his ideal Fox terrier, which, at the time, was a term used for any terrier which was used to bolt foxes out of their burrows. Her colouring was described as "...white, with just a patch of dark tan over each eye and ear; whilst a similar dot, not larger than a penny piece, marks the root of the tail." Davies, a friend of Russell's, wrote "Trump was such an animal as Russell had only seen in his dreams". She was the basis for a breeding program to develop a terrier with high stamina for the hunt as well as the courage and formation to chase out foxes that had gone to ground. By the 1850s, these dogs were recognised as a distinct breed. An important attribute in this dog was a tempered aggressiveness that would provide the necessary drive to pursue and bolt the fox without resulting in physical harm to the quarry and effectively ending the chase, which was considered unsporting. Russell was said to have prided himself that his terriers never tasted blood. This line of terriers developed by John Russell was well respected for these qualities and his dogs were often taken on by hunt enthusiasts. It is unlikely, however, that any dogs alive today are descended from Trump, as Russell was forced to sell all his dogs on more than one occasion because of financial difficulty, and had only four aged (and non-breeding) terriers left when he died in 1883. 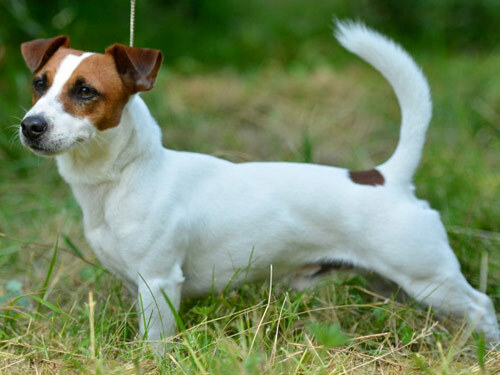 The Fox terrier and Jack Russell terrier type dogs of today are all descended from dogs of that period, although documented pedigrees earlier than 1862 have not been found. Several records remain of documented breeding by John Russell between the 1860s and 1880s. The Fox Terrier Club was formed in 1875 with Russell as one of the founder members; its breed standard was aspiration and not a description of how the breed appeared then. By the start of the 20th century the Fox terrier had altered more towards the modern breed, but in some parts of the country the old style of John Russell's terriers remained and it is from those dogs that the modern Jack Russell type descends. Many breeds can claim heritage to the early Fox terrier of this period, including the Brazilian terrier, Japanese terrier, Miniature Fox terrier, Ratonero Bodeguero Andaluz, Rat terrier and Tenterfield terrier. Due to their working nature, Jack Russell terriers remain much as they were some 200 years ago. They are sturdy, tough, and tenacious, measuring between 10–15 inches (25–38 cm) at the withers, and weigh 14–18 pounds (6.4–8.2 kg). The body length must be in proportion to the height, and the dog should present a compact, balanced image. Predominantly white in coloration (more than 51%) with black and/or tan markings, they exhibit either a smooth, rough or a combination of both which is known as a broken coat. A broken-coated dog may have longer hair on the tail or face than that which is seen on a smooth-coated dog. The skin can sometimes show a pattern of small black or brown spots, referred to as "ticking" that do not carry through to the outer coat. All coat types should be dense double coats that are neither silky (in the case of smooth coats) nor woolly (in the case of rough coats). The head should be of moderate width at the ears, narrowing to the eyes, and slightly flat between the ears. There should be a defined but not overpronounced stop at the end of the muzzle where it meets the head, and a black nose. The jaw should be powerful and well boned with a scissor bite and straight teeth. The eyes are almond shaped and dark colored, and should be full of life and intelligence. Small V-shaped ears of moderate thickness are carried forward on the head. When the dog is alert, the tip of the V should not extend past the outer corner of the eyes. The tail is set high and in the past was docked to approximately five inches in order to provide a sufficient hand-hold for gripping the terrier. The Jack Russell should always appear balanced and alert. As it is primarily a working terrier, its most important physical characteristic is its chest size, which must not be so large that it prevents the dog from entering and working in burrows. The red fox is the traditional quarry of the Jack Russell terrier, so the working Jack Russell must be small enough to pursue it. Red foxes vary in size, but across the world they average from 13–17 pounds (5.9–7.7 kg) in weight and have an average chest size of 12–14 inches (30–36 cm) at the widest part.